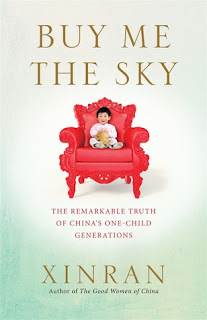 From Goodreads: With journalistic acumen and a novelist's flair, Xinran tells the remarkable stories of men and women born in China after 1979 - the recent generations raised under China's single-child policy. At a time when the country continues to transform at the speed of light, these generations of precious 'one and onlies' are burdened with expectation, yet have often been brought up without any sense of responsibility. Within their families, they are revered as 'little emperors' and 'suns', although such cosseting can come at a high price: isolation, confusion and an inability to deal with life's challenges. From the business man's son unable to pack his own suitcase, to the PhD student who pulled herself out of extreme rural poverty, Xinran shows how these generations embody the hopes and fears of a great nation at a time of unprecedented change. It is a time of fragmentation, heart-breaking and inspiring in equal measure, in which capitalism vies with communism, the city with the countryside and Western opportunity with Eastern tradition. Through the fascinating stories of these only children, we catch a startling glimpse of the emerging face of China. Thoughts: I purchased this after hearing the author Xinran on a radio show. 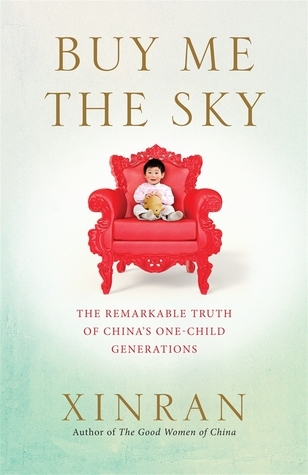 In this book she explores the results of China's one child policy and the massive rate of change in China since the 1970's. Most of us have heard stories of China's Little Emperor's and Little Sun's - only children who are worshiped and mollycoddled by parents desperate to give their one and onlies every thing. It is leading to some big issues - from young adults (22 year old), unable to open and unpack a suitcase to children who practically disown their parents, angry at home they have left them without life skills. Xinran looks at 10 different case studies, made of Chinese students she has met or children of her Chinese friends. At times she comes across as being the saviour of these children, yet displays many of the stifling qualities of their parents, placing her own expectations on them. She expects them to maintain devotion and deference to their parents wishes, but also wants them to stand on their own two feet. (often the two are contradictory as their own hopes and dreams are different to their parents) A childhood of being completely pleased at every turn has not surprisingly lead them to be incredibly self centred and unable to consider the impact of their actions on others. A life time of being pushed to study, to do everything perfectly has lead them to a fear of failure and new situations. I don't know the answer to this problem. I see China's birth rate continuing to drop as many of these only children appear reluctant to have children of their own, unable to imagine giving up the starring role they play in their parents lives. Apparently a growing number of only children are sending their own children back to their grandparents to raise, unable to cope with parenting. This was interesting and worth reading, but as one other review of it said, Xiaran gets in the way of the story occasionally. 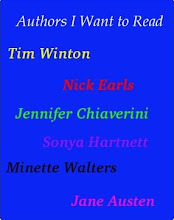 I would be interested to read some of her other work, particularly her fiction. It will be interesting to continue watching how China deals with their one child policy. Buy Me The Sky gets 3 stars.